Scientists Discover 'Remarkable Little Octopod,' Possibly New Species : The Two-Way A robotic vehicle was exploring the ocean floor by Hawaii, more than 2 1/2 miles underwater. 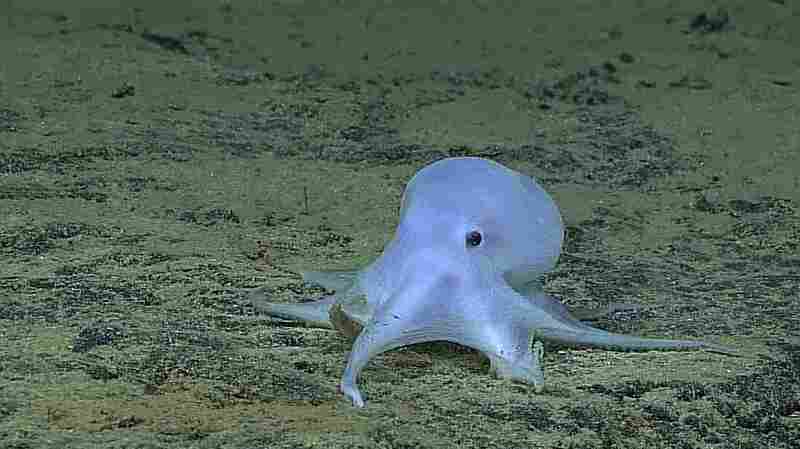 To the surprise of NOAA scientists, it came across a cute, "ghostlike" octopod. One suggested name: Casper. Courtesy of NOAA Office of Ocean Exploration and Research, Hohonu Moana 2016. NOAA says this ghostlike octopod, discovered more than 2 1/2 miles underwater near Hawaii, is almost certainly an undescribed species. In the ocean near Hawaii, more than 2 1/2 miles underwater, scientists have discovered a small, delicate-looking and ghostlike little octopod — possibly a new species. 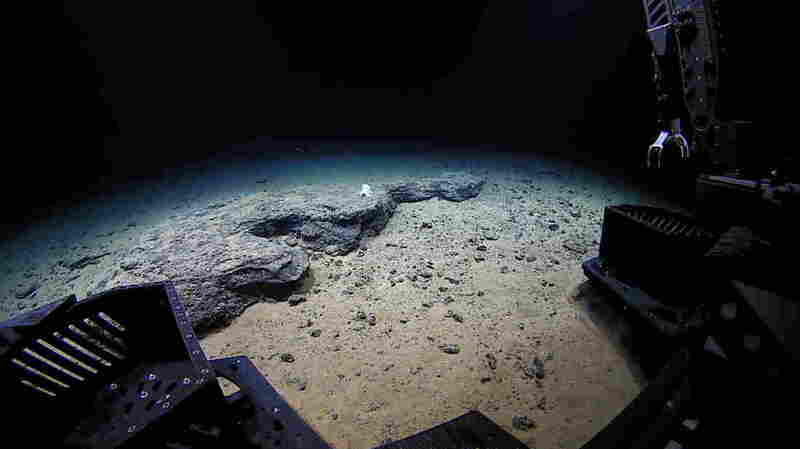 "As the ROV was traversing a flat area of rock interspersed with sediment at 4,290 meters, it came across a remarkable little octopod sitting on a flat rock dusted with a light coat of sediment. The appearance of this animal was unlike any published records and was the deepest observation ever for this type of cephalopod." Vecchione explained that cirrate octopods — which have fins between their arms and little finger-like strands near their suckers — have been reported at depths up to 5,000 meters. But the octopod encountered by Deep Discoverer was incirrate, like the familiar octopus — and incirrate octopods have never before been detected at depths below 4,000 meters. Courtesy of the NOAA Office of Ocean Exploration and Research, Hohonu Moana 2016. The remotely operated vehicle Deep Discoverer approaches the unknown octopod at 4,290 meters under the ocean's surface. "A distinctive characteristic was that the suckers were in one, rather than two, series on each arm. This animal was particularly unusual because it lacked the pigment cells, called chromatophores, typical of most cephalopods, and it did not seem very muscular. This resulted in a ghostlike appearance, leading to a comment on social media that it should be called Casper, like the friendly cartoon ghost. It is almost certainly an undescribed species and may not belong to any described genus." The appearance of the animal on the images sent back by Deep Discoverer confused the watching scientists, NOAA says. Indeed, a video released by NOAA (complete with a groovy soundtrack) features Chris Kelley, the science lead for the NOAA's current project in the area, watching the video feed from the shore and exclaiming, "That animal is not in the HURL guide." Then, as research specialist Daniel Wagner laughs, Kelley quotes Taylor Swift (kinda): "I have never, like, ever, seen that one."